Cant wait till its out on DVD either. But yeah, it's good. Haven't seen the latest episode yet but I'll be doing that today. I personally find the English dub to be better, though it doesn't have the awesomeness that is the JP OP/ED. Thankfully Commie is here to give us based dual audio releases. Praise Commie. I was waiting for someone to make the thread! I was about to go make it today. Space Dandy is ridiculously good. I love how they make fun of themselves and they do it well. The zombie episode was the best! We're dead baby! It brings my entire household out to watch it. No one cheats, we all wait til we're all gathered round to see the recording. Yey,Im not alone on this . Yes I love how they make fun of themselves and every episode ends and the next episode everything is back to normal. Ill take it on whatever format is available when it comes out.I also want the soundtrack too.Im thinkin of even cosplaying as Dandy at AX. 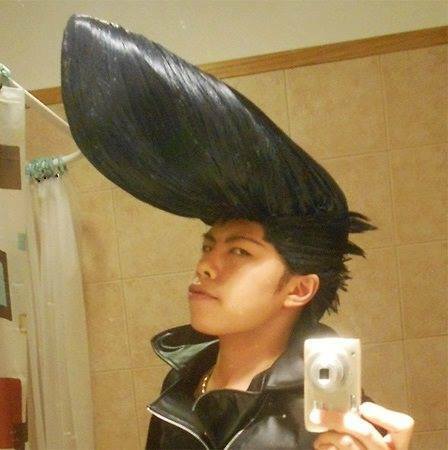 You'd be pretty cool if you cosplayed Dandy. Or should I say...you'd be dandy? "He combs the galaxy like his pompadour." The one liners are beautiful. Last nights Episode was awesome .They actually showed Heel and Toe and talked about a 4 Wheel drift. I've missed the last few episodes unfortunately. What was up with this weeks episode? It looks like it is a little lower quality than the previous... And the art style slightly changed? Please don't say its just me, someone else noticed too right? Is this really worth watching? I just got back into watching anime and am slowly going from 1 to 2 anime regularly.. and kind of lazy about it too.. is it cheesy or just 'omfg look at that' funny? It's about a dandy guy in space. If that's not your thing then just walk away, baby. Wasn't too sure about this one, I saw the intro and it reminded me of BOBOBO-BOBO-BOBOBO. I guess I'll check it out since people keep talking it up. The last episode was a bit odd,but the one before that was sad up until the ending of it,then it just went out of left field. Next weeks looks better tho. I think the series has been losing its flair in the more recent episodes. I've probably fallen asleep on half the series since it started, but that might just be its late night time slot on CN lol. But it's a pretty decent show. The latest episode was a real trip. I loved it. Last nights episodes was hilarious.Groundhog Day mixed with Dandy,baby . 26 episodes have already been confirmed for a while now. I assume they're counting 13 episodes as a season and calling it two seasons. Unless they're saying there's actually more than 26 episodes lined up, this isn't really news. I am very happy we're getting 26 episodes, in any case. This has been one of the most fun-to-watch anime I've seen since Nichijou. Well I didnt know,I thought it was just the 13 episodes and that was it.This was also just posted the other day. Now season 2 is coming with another 13,so now we have 26 episodes which is great . Wonder if the premiere something at AX since its July? Last nights episode was pretty funny. "I've gotta upload pictures of the black Suchenoko to my blog! Maybe it'll become a meme!" Also cant wait till Dandy Jacket is finished .